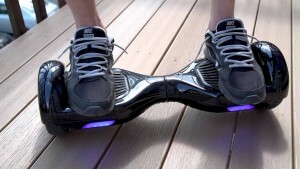 Are Hoverboards Illegal? According to CPS they are! “Hoverboards” seem to be the new gadget/toy of choice recently and I regularly see youths hovering their way around the street where I live and through the city centre of Manchester. Unfortunately, for those who fancied themselves a bit of a Marty McFly, new guidance issued by the Crown Prosecution Service has confirmed that these gizmos are actually illegal to use in public. Vehicles must be approved via European Community Whole Vehicle Type (ECWVTA) or Motorcycle Single Vehicle Approval (MSVA) in order to be licenced and registered. “Hoverboards”, or rather self-balancing scooters, do not currently meet the requirements of either scheme and are therefore illegal for road use. What might have looked like an attractive present for your children, or as a treat to yourself if you fancied a cooler way to get from A to B, has now become pretty much illegal to use anywhere except private property. If you own one of these scooters, and have used it even on the pavement outside of your own house then you have still committed an offence under section 72 of the Highway Act 1835 which makes it illegal to drive or ride a vehicle on the pavement. Ultimately, you can only ride one of these vehicles on land which is private property and with the landowner’s permission. What is classed as private property is not as straight forward as you may think and as a general rule, if other members of the public could gain access to the area, then legally it probably wouldn’t be classed as private land for the purposes of this legislation. The Department for Transport has also advised that appropriate safety clothing should be worn at all times which seems a sensible recommendation given the amount of YouTube videos doing the rounds of people falling off them (often accompanied by a humorous soundtrack). But Why Are Electric Bikes OK but My Hoverboard Isn’t? Bicycles are covered by different rules to those that apply to self-balancing scooters. Electrically Assisted Pedal Cycles must meet requirements of the Electrically Assisted Pedal Cycles Regulations 1983. Electrically Assisted Pedal Cycles (EAPC) that confirm to the regulations are considered to be pedal cycles and are therefore allowed to use cycle facilities such as cycle lanes and any cycle tracks away from the road which other powered vehicles are prohibited from using. A self-balancing scooter lacks pedals and therefore cannot fall under the same regulations. Despite the popular nickname, self-balancing scooters don’t actually hover. Perhaps if they did, it could be argued that if the scooters cannot be used on public pavements, can they be used a few inches above it? This article was written by Neil Sargeant, who is an expert Motoring Lawyer, Neil has specialised in Motoring Offences only for the past 8 years. Feel free to check out other articles written by Neil or his LinkedIN by clicking here.